In the United States, more than $1.2 Billion is spent just building nonprofit impact reports. And that doesn't include the time spent doing inefficient data gathering across disparate systems of data collection. In spite of such a staggering number of hours of administrative time, most nonprofits struggle to provide useful reports to address reporting requirements set by foundations or government grants. Often, programs get funded by various sources of capital. These could be foundation grants, individual donors, etc. 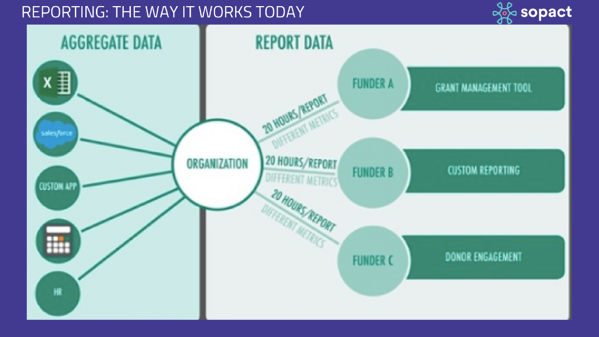 For institutional funding, nonprofits are required to provide funder specific reports that involve mutually agreed upon output or outcome results. To examine why this is a problematic issue first take a look at a current state of an average non-profit. Have internal IT staff that attempt to aggregate data in different systems such as Excel, Salesforce, custom apps, accounting, and HR. Often the data that is reported is simply operational (such as activities and outputs). Aggregating primary data and providing unique beneficiary results by services is time-consuming and is therefore not given much priority. Impact measurement systems are not built to measure long-term progress. If outcome, output data are stored in a different system, it is difficult to track historical results. 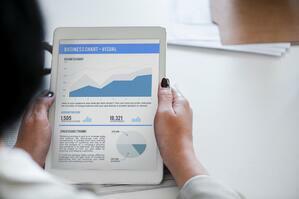 Where to start to build better nonprofit impact reports? There are four stages of data management for the impact management cycle: COLLECT, COMPILE, ANALYZE, and COMMUNICATE. Selecting fewer tools (to do just as much work) is a good way to be more efficient and effective. In other words, there are many tools which overlap between the stages and by choosing those that do, you can minimize the number of tools used by your organization. Keep the process as simple as possible. Map out some of your capacity requirements for various tool types to see where you might be able to reduce the number of tools used while still getting the necessary work done. If data are collected in an efficient way, managed in a clean way, and analyzed in a relevant way, the resulting impact report will shine. The first step, therefore, is to determine the right data collection tools. The type of data collection tool depends on the type of data required. 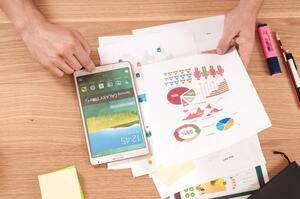 Examine where data is coming from and how. Is it survey based? Surveys can be paper-based or forms-based (online). Is it online or offline? Developing countries may need offline data collection possibilities. Is it on-premises data collection? Data collected in office. Do you have a customized data management system? Large organizations and foundations often invest in a customized solution for data management. Do you have case management systems? Using multiple tools to collect data can make the compilation of data particularly challenging. Always keep users of the system in mind while selecting data collection tool to have as clean data as possible. The compilation of data from the field can be particularly challenging due to the use of multiple tools. Using systems like paper, Excel, Google Sheets, survey tools, CRM like Salesforce, etc. to collect data creates DATA ISLANDS. We firmly believe that the downstream partner/organization who is collecting field data, aggregating them by funder requirements and managing its performance to meet theory of change (TOC) should have better and fewer tools so that they can control disaggregated data efficiently for actionable results. The Impact Cloud developed by Sopact can help avoid such data islands while streamlining the impact data management process from start to finish. Use seamless integration of multiple systems into a single platform to reduce time spent on consolidating data will help usher in a new era of impact reporting for your organization. This strategy allows organizations to spend more time analyzing data, building their impact reporting engine so that it can rapidly integrate qualitative and quantitative outcomes to TAKE ACTION. While this practice is very prevalent in corporate IT world, it can be useful in the social sector IT as well.